The results are in: 2018 Best Selling favorites! We love her, our brides love her - Paloma is a tride and true favorite for Hushed Commotion brides. Modern vintage beading details matched with an ombre feeling Paloma is literally perfect and season after season our brides are continuing to fall over her. Craving Pearls? SO ARE WE! Corey is our go to belt for our ladies craving just that finishing touch of pearls. Made usually one a glitter gold or silver sash but also available on ivory or light ivory sashes. Heather is minimal sparkle perfection from our spring 2018 collection and the Hushed Commotion ladies also cannot get enough. Most of our brides like heather with a light ivory sash to go with the beautiful light ivory dressed that are popular now. Minimal Art Deco Cora is one of our lace sashes that comes in gold or silver matched with just the right touch of crystal! Want a sash but don’t want something over the top - the Cora sash is for you! Feeling a bit whimsical and artsy on your wedding day - Brett is the most dreamy with our signature brushstroke stones paired with ivory perfection. Even better, Brett matches brides favorite Brooke earrings! Blake has really become a Hushed Commotion superstar. Wear it in the front, in the back, wrapped around a bun, all the ways! We even had a bride this year wear Blake as a belt with ribbon added. Also, Blake is now offered in a new mother-of-pearl laser cut option as well as as a small three moon option. Forever everyone’s favorite hair vine, Matilda - subtly feminine and floral. Offered in gold, silver and rose gold with tiny pearl or crystal accents! Farm house wedding ready but also not too sweet for our city gals craving something floral! 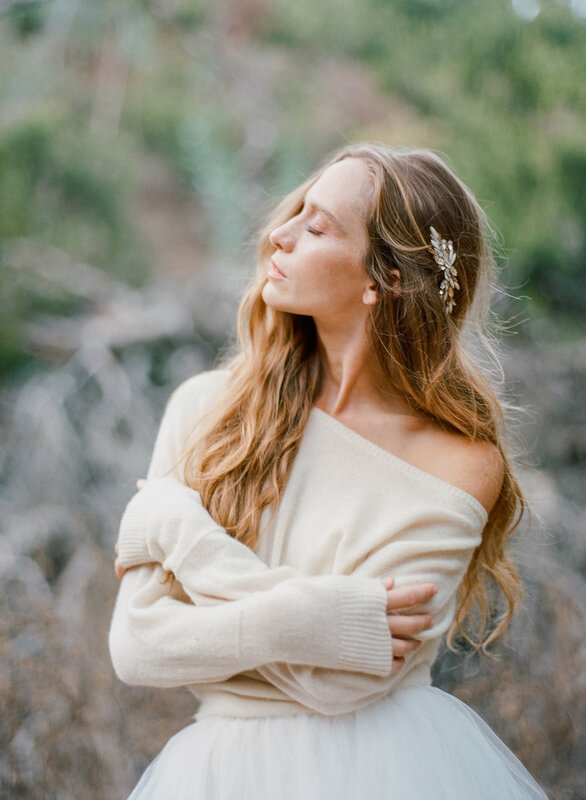 Natural sparkly bliss with a bit of edge our Fallon comb has been a bride favorite season after season with its mix of tea colored, buttercup and clear crystal stones and natural inspired geometric shape. 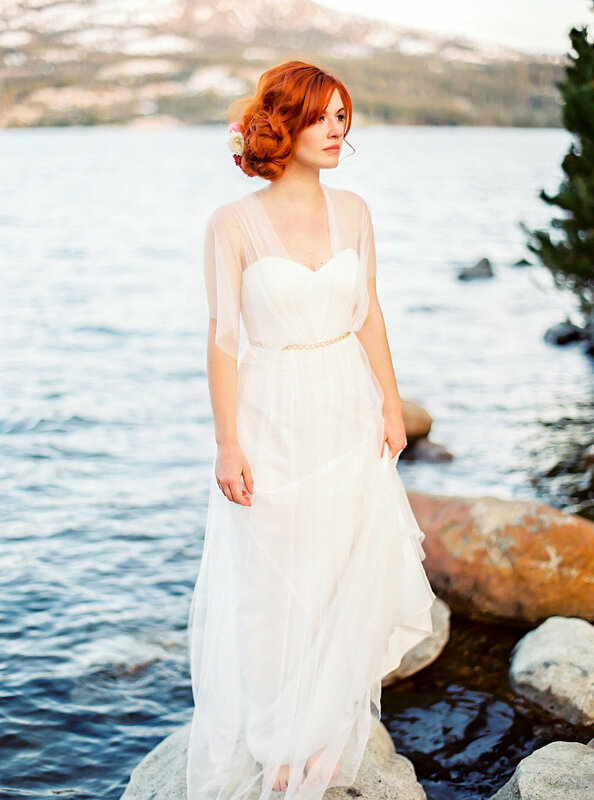 Wear fallon with your hair down and a bit swooped to the side or tuck fallon into a beautiful wedding day bun. 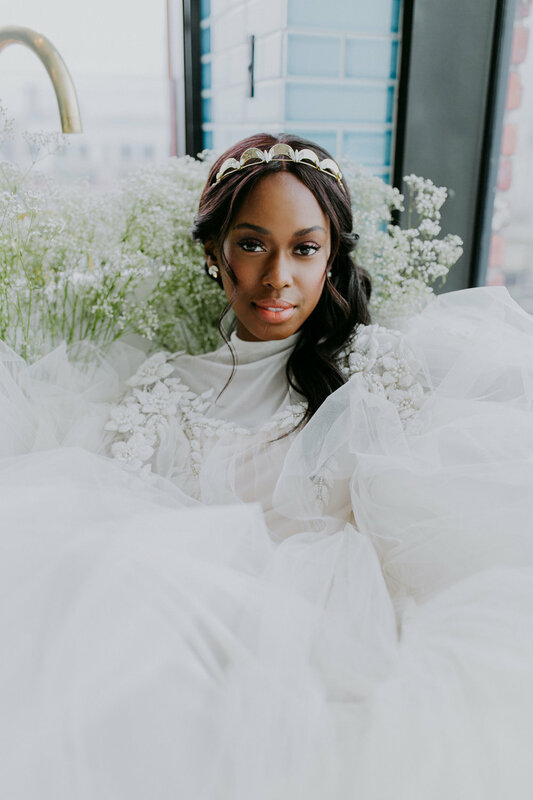 A boho inspired tiara with an herbal twist and just a bit of crystal - the Hushed Commotion Quinn tiara is loved by many HC brides and even better super easy to style in your wedding day hair! Roux is the new girl in town! Brand new for our 2019 collection and already a huge hit! 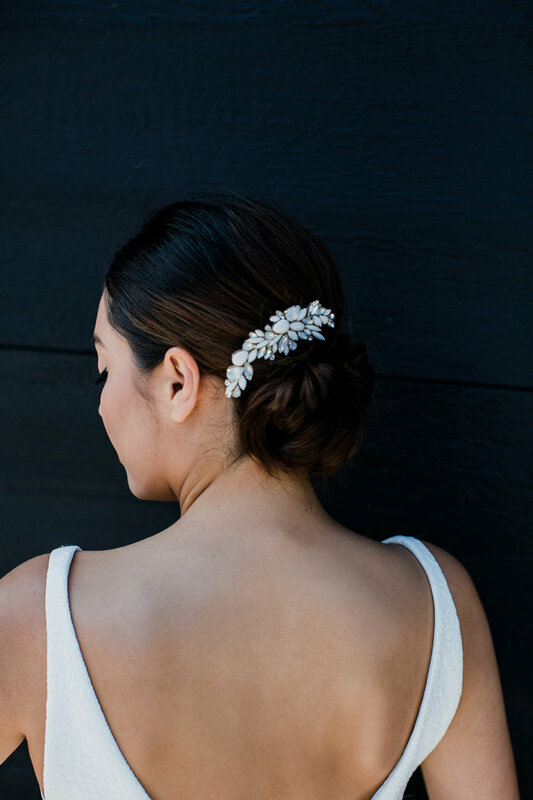 Roux is matched to perfection with our new favorite iridescent white crystals and will curve into your wedding day do with ease and perfection. Sarah earrings are a Hushed Commotion staple and the finishing touch a lot of our brides are looking for. Even better Sarah is now offered in an array of colors. Hushed Commotion brides even love gifting Sarah earrings to their brides maids! As mentioned before our Brooke earrings match our loved Brett sash! Wear them together or separately but you are sure to love both regardless! Brooke earrings are flying out of the HC weekly our ladies simply cannot get enough of them. Searching for some minimal beauty with just a teeny bit of sparkle - our best selling Erin earrings are for you! A pair of moonstone beads and a bit of crystal the Erin earrings will shimmer as you dance your wedding night away! Blushing beauty Mandy earrings are a sweet blush colored dream. A bit more of a statement and brides love them but if you are looking for the feeling of Mandy but in something a bit smaller - check out our Mandy Minis! Last, but surely not least a true Art Deco romance - Hushed Commotion Morris earrings. Morris has everything you could want in an earring - a bit of sparkle, a bit of pearl a little modern metal all wrapped into one. Brides have loved Morris is this and they match perfectly with our Dayton belt if you are searching for a matching duo!